sunshine blog » Spotlight: Georgetown, Washington D.C. In my write-up of the top 10 things to see in Washington, one of the areas I mentioned was Georgetown. As a popular neighbourhood excursion and one of the prettiest and often relaxing places in the city, Georgetown really is a must see. Let’s dive in more with some additional tips and ideas for navigating this great area. 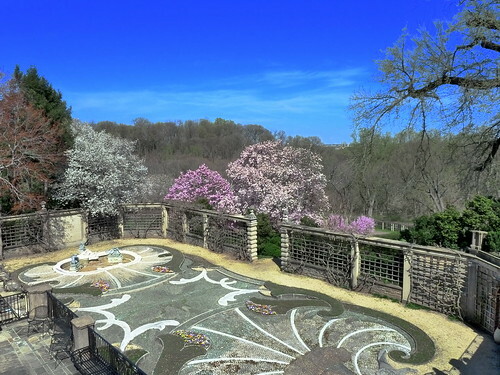 Perhaps the spotlight of Georgetown is a place called Dumbarton Oaks, which combines a mansion home, free museum, and extensive gardens that are no doubt the main highlight. The site is most well known as where world leaders met to draft the charter of the United Nations, but you’ll probably find the extensive art collections more interesting, as well as the long lanes perfect for strolling on a sunny afternoon. Between Prospect and M Street you’ll find the notorious Exorcist Steps – these steps featured quite a momentous moment in the film. If you haven’t seen it but are planning a trip and day out in Georgetown (and can stomach a bit of old-fashioned horror), watch it. It’s a great film, and there are other places in the area featured – such as the Dalghren Chapel over near the University. If you’ve got good weather in D.C., you’re in luck. I’ve never been so lucky, as most D.C. summers are deathly hot and humid, winters deathly cold and damp. But, persevere, as there are some great things to do with blue skies. It might be morbid, but I love a good walk through two of Georgetown’s cemeteries, Mount Zion Cemetery and Oak Hill Cemetery – they’re wonderful photography opportunities and very peaceful places. Theodore Roosevelt Island is another popular outdoor spot for walking, running, and biking. Or hit the water – there are options for kayaks and other boating excursions out onto the Potomac. Lastly, the Chesapeake & Ohio Canal Park runs through Georgetown and this is arguably one of it’s best urban stretches for a bit of outdoor relaxation. Last but not least is a bit of shopping – though if you’re coming to Georgetown for a bargain, you’ll be sorely disappointed, as this is the high end part of town. There’s nothing wrong with window shopping, though, as some of the areas shopping arcades and historic buildings are part of the experience. There is a shopping mall, but I suggest you just let you feet take you into some of the art galleries, vintage clothing stores, and other boutiques that are all over the area. You never know if you might find a bargain, whether for yourself or a great souvenir for a friend.